Cretan themed T-shirt "I'm Cretan" was added to your shopping cart. Cretan themed T-shirt "I am Cretan" with the figure of a Cretan mustached man. Ideal gift for those who love Crete and the Cretan culture. Cretan themed T-shirt with the figure of a Cretan mustached man wearing the traditional black turban (sariki). Ideal gift for those who love Crete and the Cretan culture. Available in grey colour and sizes M, L, XL, XXL. 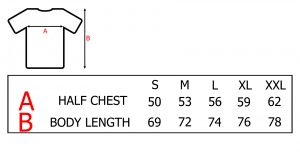 When ordering, please write the size in the comments section.